Google has already launched Android 5.1 Lollipop, a new version of its mobile OS which is supposed to fix lots of the issues that Lollipop adopters complained of many times. The new OS is also meant to improve performance on some smartphones and tablets, as well as eliminate the occasional lags. Unfortunately, Android 5.1 Lollipop is only available for Nexus devices, like Nexus 6, Nexus 7 and Nexus 10. And it will take quite a long time for Android 5.1 Lollipop to arrive on other smartphones like Samsung Galaxy S5, LG G3 or HTC One M8, which all run a previous version of the operating system. Well, that is quite unfortunate because Android 5.1 Lollipop should really boost any of these smartphones mentioned earlier. At least that's what it did for the Nexus 6. The folks over at Ars Technica have tested their Nexus 6 device with a version of Android 5.0 Lollipop onboard, and then with the latest one released by Google last week. 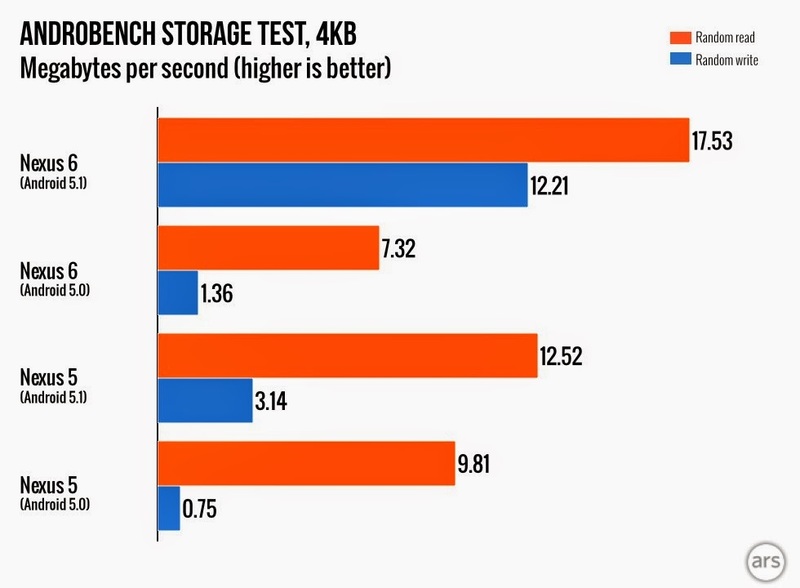 The benchmark chosen by Ars Technica is AndroBench. As proven by the results the Nexus 6 with Android 5.1 Lollipop provides more than double the performance of the same device running Android 5.0 when it comes to reading and writing speeds. Sequential speeds on the other hand are about the same for both Android 5.1 and Android 5.0, which means that games will load in about the same time. 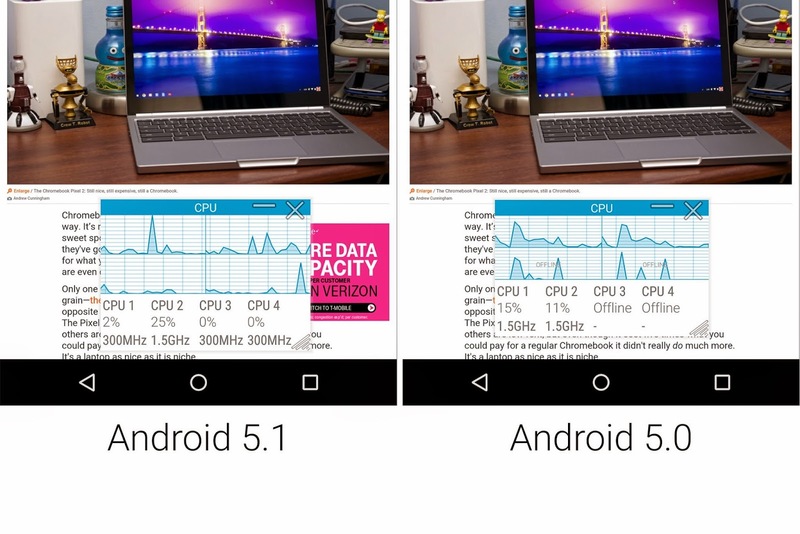 On CPU tests, the Android 5.0 Lollipop shuts down processors 3 and 4 and leaves only two of them running, but in Android 5.1 Lollipop all cores are enabled and ready. 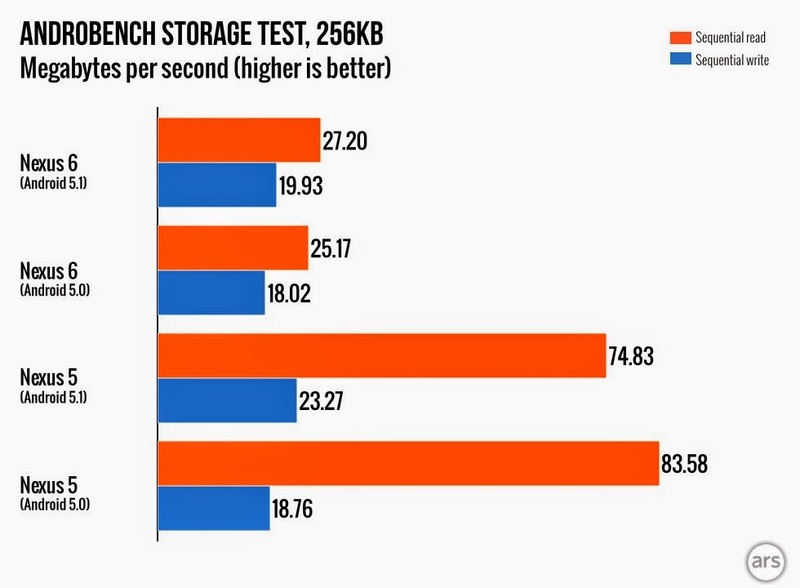 In the same piece of news, Nexus 5 was subject to the same tests and the results are about the same, which proves that Android 5.1 Lollipop really optimizes the operating system further for better overall performance.